India – a veritable wonderland of color, contrast and incomprehensible mystery! It is into this alluring kaleidoscope that takes travelers accustomed to their luxuries and comforts and gently delivers this world in palatable layers of luscious, exotic experience. From the overwhelming crowds on the streets, through the many sounds and scents of the market, you’re drawn towards the awe-inspiring silence within the age-old palace. One cannot travel through India and remain a spectator without being swept away by the experience time and again. Let your eyes wander as India offers reflection. Experiencing India is like watching a movie. You can lean back and relax while allowing the experience to unfold, or you can climb to the edge of your seat and marvel at every last detail of this fascinating wonderland! You’ve just arrived in a land of 1.2 billion people, home to every major religion in the world and a dizzying variety of histories and languages, and one of the most beautiful countries in the world. Welcome to beautiful India! Arrive at New Delhi’s Indira Gandhi International airport, Terminal T-3. Special VIP assistance accorded on arrival. The guests will be met by a Hi Tours representative at the gate and escorted to Immigrations where you will be assisted. There after collecting your bags, you will be met with your English Speaking Guide. Special reception at the airport with welcome garlanding, later you will be escorted to your hotel. Note: We will ensure all VVIP amenities including Fruit Basket, Cookies are kept with flowers. A welcome gift with your compliments will pre-place in the guest’s room. Spend the morning exploring the old city. Commence your day with a visit to the 17th century Jama Masjid and ride a rickshaw through the narrow lanes of the Chandni Chowk and walk through the spice markets. Our recommendation: lunch at Café Lota at the Crafts Museum – the menu featuring an eclectic selection of pan Indian cuisine. Later you have time to tour the museum, which houses a treasure trove of Indian art and architecture. Ranging from metal ware woodwork, masks, painting, terracotta and textiles, the museum showcases the best of India’s craft heritage. Housed in the tree-shaded courtyards, are artisans from various parts of India, recreating some of the items you saw in the museum. Next visit Qutab Minar* – the tallest tower in world for centuries, erected by first Islamic rulers of India and still the most imposing, artistically carved and engraved sandstone pillar anywhere. Enjoy a drive through Lutyen’s Delhi with photo stops at India Gate and the muted red sandstone Parliament Buildings by traditional Black & Yellow cabs. Day culminates with an interesting religious and philosophy experience as you visit the Bangla Saheb Gurudwara and see the community kitchen where thousands of worshippers are fed round the clock. We constantly research for new ideas to showcase the destinations that are featured on our guest itineraries. Whether it is visiting monuments or museums or savoring India’s diverse cuisine, we partner with experts and design experiences that promote learning. Historians, musicians, artists, culinary experts, architects and connoisseurs have in the past enlivened India for our guests. This morning transfer to the railway station to connect train for Agra. Delhi – Dep. 0810 Hrs. Agra – Arr. 0950 Hrs. Upon arrival meet with our representative and transfer to the hotel. This afternoon you will visit the Agra Fort* which dates back to the 11th Century and captured by several rulers before it was rebuilt by the Great Mughal King Akbar in the 16th Century. Evening Visit Taj Mahal* at sun rise on decorated horse driven carriages, Taj Mahal is one of mankind’s greatest architectural feats. 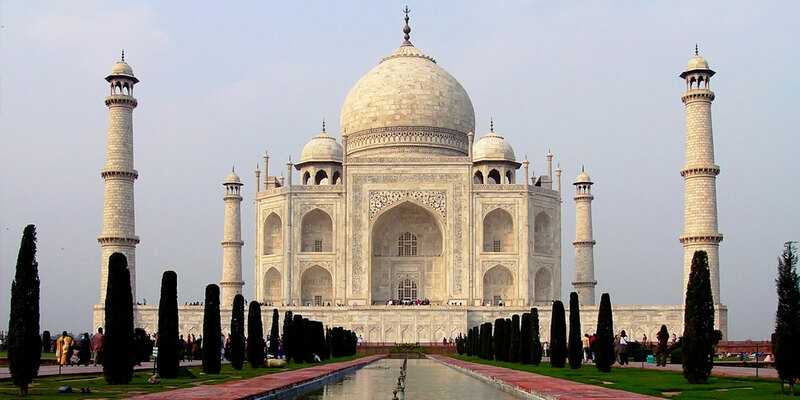 Built out of white marble by Mughal emperor Shah Jahan in memory of his favorite wife, Mumtaz Mahal, it was erected by 20,000 laborers over a 12-year period. The entire monument is a masterpiece of symmetry (Closed on Friday). Leisurely this morning depart for Jaipur, en-route visit Fatehpur Sikri. The magnificent fortified ghost city of Fatehpur Sikri was built by Emperor Akbar in 1569 as his capital and abandoned 15 years later, allegedly due to a severe scarcity of water. You will visit the graceful buildings within such as the Jami Masjid, the tomb of Salim Chisti, the Panch Mahal, Diwan I Khas and other palaces. It is a place where Islamic architecture fuses with Hindu and Jain decorative art. Morning drive to Amber and its glorious hilltop fortress. You will ascend the fort on Jeep. It is known for its unique artistic style, blending both Hindu and Muslim (Mughal) elements, and its ornate and breathtaking architectural mastery. Tour the chambers and hallways of the palace, famous for the excellence of its design and decoration. Within the complex is Ganesh Pol, an imposing gateway painted with the images of the elephant-headed god, Ganesh. Pierced screen windows offer views from different vantage points, and shimmering mirrors encrust the walls of Sheesh Mahal. Optional – Visit to Elephant village near Jaipur, this a true experience! A village of about 100 elephants and their trainer, you can help the resident mahouts (elephant trainers) in their daily activity, feeding , bathing and cleaning elephants, get your hands to paint your favorite elephant ! Learn about elephants and about their life, challenges, needs and training ! Later proceed to Pink city of Jaipur. Stop for a photo at the Hawa Mahal or the Palace of the Winds.” This beautiful façade is probably the most-photographed in Jaipur, with its ornately carved windows designed so the ladies of the palace could look out onto the streets unobserved. Visit the City Palace Museum, which has a priceless collection of antiques, costumes and armory of the Mughals and Rajputs including swords of different shapes and sizes with chiseled handles. It also has an art gallery which displays a collection of miniature paintings, carpets, royal paraphernalia and rare astronomical works in Arabic, Persian, Latin and Sanskrit. In the evening, enjoy a short Tuk Tuk ride across the market. Optional – Go for an experience – Cook as an Indian! Visit a local Rajput family, where you’ll be their guests and get into their kitchen and learn the secrets of magical Indian spices, participate and help them to prepare some of the North Indian recipes followed by a traditional Rajput Dinner. After breakfast transfer to the airport to catch a short flight to Udaipur. Upon arrival we will proceed for city sightseeing visiting; The vast and exquisite City Palace, a well-fortified, majestic white monument. Afternoon visit the Jagdish Temple, a 16th-century temple dedicated to Lord Vishnu, it is the largest and most splendid temple in Udaipur. Drive past Fateh Sagar Lake and visit Sahelion-ki-Bari, the Garden of the Maids-of-Honor, which has numerous fountains in four pools, embellished with delicately chiseled kiosks and elephants. “Crystal Gallery”. Located at the City Palace, it has a rare collection of Osler’s crystal ordered from England by Maharana Sajjan Singh in 1877. Culminate the tour with a visit to Maharana’s Vintage and Classic car collection. On display are the magnificent Rolls Royce, 1939 Cadillac open convertibles, and rare Mercedes models, 1936 Vauxhall among others. Evening enjoy boat ride on Lake Pichola (sharing basis) . Later check inn to the hotel. After a leisure morning, proceed to Devigarh and visit the Shiva Temple at Eklingji. Island Expert Travel recommended, enjoy lunch at Hotel Devigarh by Raas. Working to help improve the living conditions of Dewara’s residents, Seva Mandir’s association with village goes back many years-in 1988, It started a women’s patchwork programme known as ‘Sadhna’ which aims to provide an alternative source of income to women. Thus, handicraft, which includes exquisite applique and embroidery work, was introduced to the women of Delwara. Return to hotel in Udaipur. Rest of the evening will be at leisure. For those interested, we can customize a walk through the old city as you discover the various facets of Udaipur’s bazaars, and artists and artisans at work. Consistently rated as one of the top restaurants of India, the Sunset Terrace offers dramatic views of Udaipur’s most famous landmark palaces. The open-to-sky restaurant offers a varied menu to choose from while taking in the magnificent natural scenery. Live musicians add to the magic. The ornate Mor Chowk (Peacock Courtyard) is often referred to as the most spectacular courtyard of the Udaipur City Palace Museum. Five peacocks decorate the courtyard, which is also covered with beautiful glass inlay work. The Maharanas held special audiences and dinners there. Mor Chowk was constructed during the reign of Rana Karan Singhji. However, Maharana Sajjan Singhji added the glass inlay work and peacocks later, during 1874-1884. An astonishing 5,000 pieces of mosaic tiles have been used in creating the works of art. The higher wall in the east of the courtyard sustained a great deal of weather damage over the years. In 2004, local artisans commenced restoring it and took 14 months to complete the task. Upon arrival, our representative will meet you at the Mumbai airport and transfer you to your accommodations and assist in check-in. Later go on a tour of the city to explore its architectural heritage. Visit Gateway of India, the principal landmark of Mumbai, was the principal port when the visitors came to India by ship. The gateway was conceived, following the visit of King George V to India in 1911, and was officially opened in 1924. Its architecture is akin to the conventional Arch of Triumph, with elements derived from Muslim styles of 16th century Gujarat. Soon you arrive at Mani Bhawan, or the Gandhi Museum, for an intriguing visit. Serving as Mahatma Gandhi’s Bombay base between 1917 and 1934, Mani Bhawan now serves as a museum and memorial. After enjoying the opportunity to glimpse in the life of a great historic figure, now become introduced to the lives of the locals with a look at the fascinating Dhobi Ghats. Each morning, laundry from all Mumbai is brought here to be soaped, boiled, beaten and thrashed. After being aired, pressed, folded and wrapped, the clean bundles are returned from whence they came. Pause here for photographs. Continue to Chhatrapati Shivaji Maharaj Vastu Sangrahalaya (formerly the Prince of Wales Museum). The CSMVS is a gorgeous heritage building in the heart of South Mumbai’s Fort area – the city’s unofficial culture district. Designed by the same George Wittet who would later create the Gateway of India, this museum displays a large collection of Indus-era artifacts, interesting pieces from Indian history like the armour of Emperor Akbar and an extensive compilation of Chinese and Japanese porcelain. Before you step inside be sure to stroll around the gardens, there are numerous sculptures dotted throughout the property, and don’t miss the collections donated by eminent Mumbai families like the Tatas. Rest of time free at leisure. This morning transfer to Mumbai International airport for your onward flight.